Update: This article has been updated with a section introducing the Fourth Wave of Coffee. April 17, 2016. 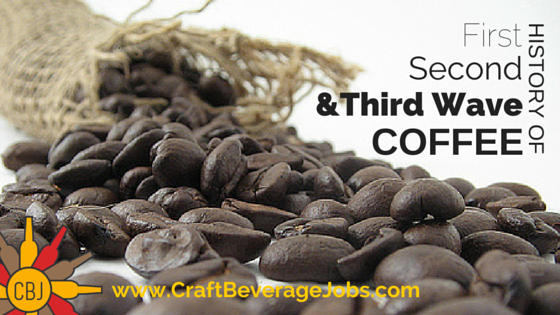 Have you ever wondered what the term third wave coffee actually means? Third Wave references the current movement within specialty coffee that appreciates coffee as an artisan or craft beverage. Coffee, in all of its processes, from the origin of the harvested bean to the roasting and brewing process, is treated with the same reverence as fine wine and craft beer. 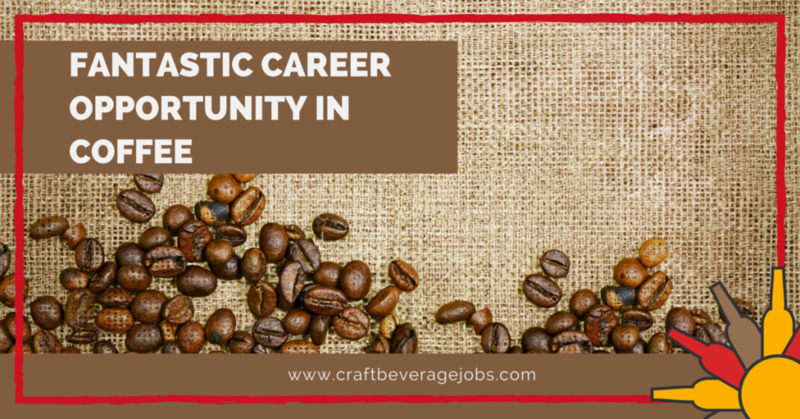 This culinary approach to coffee is nothing new to the industry, in fact, it is a re-birth from the days before tin cans and instant coffee hit retail shelves, making coffee a convenient caffeine buzz rather than an enjoyable craft beverage. 1st Wave: Growing coffee consumption exponentially. 2nd Wave: The defining and enjoyment of specialty coffee. 3rd Wave: Purchasing coffee based on its origin and artisan methods of production. There are significant events from each movement, which illustrate these unique priorities. First wave coffee can trace its roots back to the 1800’s, when entrepreneurs saw a market for providing coffee that was both affordable and “ready for the pot”. Coffee brands like Folgers and Maxwell House would quickly become household names across the United States. This first wave receives criticism for sacrificing taste and quality to promote convenience and mass production.While the quality of the mass marketed brew may be frowned upon, the innovations in processing, packaging and marketing would allow the coffee industry to skyrocket into the future. Check out this current opening in Coffee! Perhaps the most significant innovation came from shipbuilders turned coffee roasters, Austin and R.W. Hills, founders of the Hills Bros. Coffee. In 1900, R.W. Hills invented the process of vacuum packaging. The process removed air from coffee tins, resulting in fresher beans. This process changed the way coffee would be packaged to this very day. The source for coffee moved from the local roaster to the retail shelves of grocers from San Francisco to Chicago and eventually New York. In the early 1900’s, America was on the move! Modern industry produced and marketed products that were both time-savers and convenient to use. It was the era of frozen dinners, electric razors, hair dryers and instant coffee!! In 1903, Japanese-American Satori Kato, applied his dehydration process for soluble tea, to coffee and received the very first U.S. patent for “Coffee Concentrate and Process of Making Same”, better known as “instant coffee” (U.S. Patent No. 735,777 – August 11,1903). Instant coffee was quick and easy, and didn’t require brewing equipment. It was perfect for the rations of WWI soldiers in 1917. 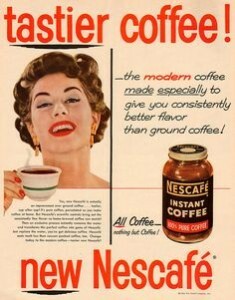 By 1938, Nestle’, with their Nescafe instant coffee, became the most innovative of the instant coffee brands and marketed their new instant beverage, even supplying the U.S. military for WWII. The new modern lifestyle of the mid-1900’s would give instant coffee its spotlight. By the 1970’s almost one-third of imported roasted coffee was processed into instant coffee, but by the 80’s the discerning taste-buds U.S. “foodies” brought its downfall. In the mid-1800’s, William H. Bovee founded The Pioneer Steam Coffee and Spice Mills company in California, where he began producing coffee that was pre-roasted, ground and sealed in small tins. What was previously considered a luxury for the upper class, Bovee made available for every middle-class kitchen. The carpenter Bovee hired to complete the construction of Pioneer Steam mill was a very young, James A. Folger. According to Folgers Coffee history, after construction of the mill was completed, James ventured out to find gold. He left the mill but not before stocking up on samples of Pioneer coffee and spices, which he distributed to grocery stores all along the way. Long story short, James returned in 1865 to be a full partner and by 1872 bought the company, renaming it J. A. Folger & Co. The mass marketing of coffee in the United States was born. I was surprised to learn that the Folgers slogan, “the best part of waking up” is relatively new to the 150-year-old company. In 1984, the original jingle written by composer Leslie Pearl made its debut and has been a part of the brand’s identity ever since. In the late 1800’s a coffee broker by the name of Joel Cheek named his new coffee blend “Maxwell House”, after the Maxwell House Hotel in Nashville, Tennessee where his special blend was served. Along with business partner, John Neal, they founded the wholesale grocery distribution company, Nashville Coffee and Manufacturing with the Maxwell House Coffee brand leading their portfolio of products. The slogan, “good to the last drop” began to be used in Maxwell House Coffee advertising, after claims that the phrase was made by President Roosevelt upon taking a sip of Maxwell House Coffee. The company prospered in the 1900’s and by 1924, the advertising budget for the Maxwell House brand was a whopping $276,894. The marketing investment paid off, and one year later Maxwell House Coffee was the most well-known brand across the United States. Before moving on to the second wave of coffee, I would be remiss not to mention the invention of the first automatic drip home coffee maker from entrepreneur Vincent Marotta. Marotta called his coffee maker, Mr. Coffee! 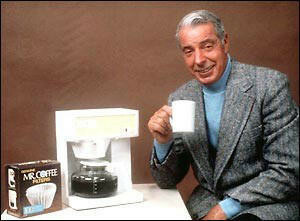 Mr. Coffee machines were a marketing sensation, with “The Yankee Clipper” himself, Joe DiMaggio as its spokesperson. By the end of the 1970’s, over 40,000 Mr. Coffee’s were being sold every day. For a timeline of 1900’s coffee history, check out The History of Coffee by Professor Peaberry. One of the driving forces in the transition into the second wave was a reaction to the “bad coffee” being marketed under the first wave. 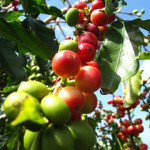 Consumers expressed a desire to know the origin of their coffee and understand the unique roasting styles of what will now be called “specialty coffee” beans. This knowledge added to the enjoyment of coffee as an experience, rather than just a beverage. Some coffee historians site the wine industry as an influence, with its principles and applications now applied to the coffee industry. Our coffee vocabulary began to change with second wave. Words like espresso, latte, and French Press became common among lovers of specialty coffee. The criticism of second wave is that it lost its way, forsaking the source of the bean for the social experience of drinking coffee. Coffee shops became big business, luring consumers to a brick-and-mortar shop to drink their favorite coffee beverage. The coffee business most often associated with illustrating second wave coffee is Starbucks. Patterned after the business model of Peet’s Coffee in Berkeley, California, Starbucks opened its doors in 1971, specializing in serving fresh roasted coffee beans. Friends and business partners, Jerry Baldwin, Zev Siegl and Gordon Barker were passionate about fresh coffee from freshly roasted beans. Starbucks was more third wave than second in its origin. When Howard Schultz joined the Starbucks team as Director of Marketing, he worked hard to convince the trio of owners to sell brewed coffee drinks. They declined the notion. Schultz moved on to found a very successful coffee chain, Il Giornale Coffee and in 1987 returned to purchase Starbucks for $3.8 million. Pre-ground coffee, espresso’s and latte’s hit the coffee menu! The new coffee chain surpassed its growth goal in the 1990’s by opening a new location every work day and by the year 2000 had over 3,000 locations. Starbucks became the poster child for second wave, not only giving specialty coffee its own language, but making it social by introducing the masses to the coffee shop experience. Second wave entrepreneurs began to follow the Starbucks model and create havens for enjoying coffee all across the U.S. The social experience of drinking coffee became more important than the artisan process of producing coffee. The term “third wave” is relatively new, so there is not much history to talk about. The use of the term began in 2002 with an article by Trish Rothgeb (formerly Trish Skeie) of Wrecking Ball Coffee Roasters. In the article, published in the Roasters Guild publication, The Flamekeeper, Rothgeb defined the three coffee movements as “waves”. Following this description, “third wave” became the mainstream term representing the movement. The third wave of coffee is characterized by coffee lovers interested in the character of the coffee itself. Sometimes this movement is more of a reaction against bad coffee and the way bad coffee has been promoted. Not that marketing and social are not important in third wave growth, but they are not the driving force. Look at it this way: In the first wave, the consumer led the way. It was all about availability to the masses on a national scale. With second wave, the coffee was better, but marketing the experience was the driving force. With third wave, production and marketing take the back seat, and the product takes center stage. With a new emphasis of transparency within the coffee industry, consumers can trace the heritage of their favorite coffee to the very farm from which it was harvested. The soil, altitude, and method of processing become important factors to the discerning pallet. [ See our 2015 Guide To Kona Coffee as an example of third wave transparency. ] The majority of roasters and coffee shops associated with third wave are small businesses, independently owned and operated. Roasters and coffee shops who roast beans in-house, represent entrepreneurs who love great coffee and have created a business to share that coffee with their communities. Larger third wave businesses, who have made a name for themselves are Intelligentsia Coffee & Tea in Chicago; Counter Culture Coffee in North Carolina and Stumptown Coffee Roasters of Portland. Known as the “Big Three”, these coffee roasters exemplify the philosophy and goal of third wave. Each is an evangelist for product quality, direct trade, and sustainable business practices. Coffee education also takes a significant role in their respective business models, believing that a better-educated consumer strengthens the industry. Is There A Fourth Wave For Coffee? As you can see, coffee and the coffee industry have come a long way over the past 100 years. The progressive stages have brought us to a period where coffee is not just your morning wake-up call or after-dinner-with-dessert beverage. Today, coffee is a culinary experience. Homage is paid to its origin, brewing methods and all the nuances of its flavor. So, we ask the question, where will it go from here? Is there another wave, a fourth wave? In researching fourth wave, the descriptions of the term are as diverse as coffee itself. What some define as fourth wave, others define as third. Many are of the “enough already” attitude and dismiss the waves altogether. Perhaps the most balanced view is that we are experiencing a New Wave and a fourth is yet to come. Whatever your opinion about the coffee waves, you have to admit coffee is in a great place right now. If we have to define a fourth wave, perhaps the best way to characterize it is this way – it’s the best of all waves combined in the rise of the independent specialty coffee business. First wave brought innovation to the coffee industry. For the first time, talent and money were invested in ways to provide coffee to the masses for a profit. The development of new delivery systems allowed companies to provide coffee to millions of people at one time. It’s that same innovation that enables us to have access to quality coffee today. Today, coffee roasters are starting their own online and brick-and-mortar businesses, providing “roast-to-order” coffee to consumers around the world. It is very easy to have freshly roasted single-origin Ethiopia Hambela or Costa Rica Natural coffee offered right in your own community coffee shop or the beans shipped right to your door in a matter of days. The boom of the specialty coffee shop has given coffee a new identity. What was once only enjoyed at home became a social experience to be shared with friends and strangers. In the second wave, consumers drove companies like Starbucks and Caribou to the top of the coffee industry. Today the independent coffee shop business is where fourth wave growth is seen. Set a Google Alert for coffee roasters and watch how many online news sites are highlighting new coffee businesses coming to neighborhoods all across the United States and Great Britain. Today’s emphasis on transparency and education is a key for success and can be seen both commercially and socially. You no longer have to be BIG COFFEE to have an influence in the market. A changing of the guard for industry standards and practices has produced a coffee market more vigilant for equality, fair trade and sustainable practices. 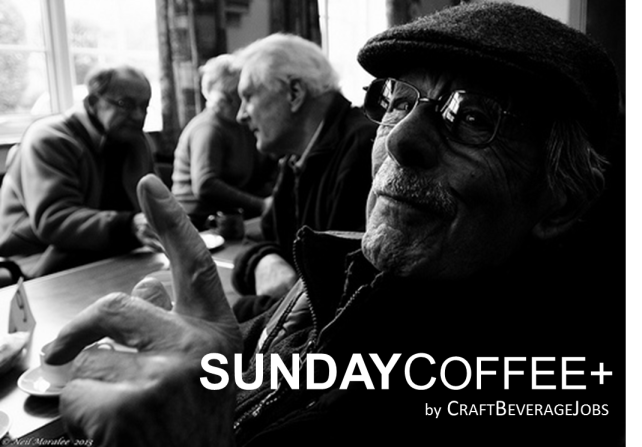 Check any independent coffee website and you will see keywords such as single origin, micro-lots, and roast dates. Specific information about your coffee is highlighted, such as the altitude where it is grown and the method of processing that was used. You can probably even find the name of the farmer who harvested your coffee. Is it a fourth wave? Only time will tell. But whatever the “wave”, the coffee industry has matured into a seasoned enterprise. We feel lucky to be its daily beneficiary! Personally, the three waves of coffee represent my own personal progression in my love for coffee. My first introduction was the tin can of Folgers my Mom would brew every morning before school. If it was cold enough outside, she would pour me a cup and I would add enough sugar milk to make it taste good. Since it was my only reference for how coffee should taste, I assumed it was “good” coffee. I remember my first Starbucks experience when I was in college. The cool atmosphere, the scones, and having to say ‘grande’ for a large cup of coffee. More importantly, I was introduced to good coffee. It awakened my palate to explore better choices and broadened my coffee horizons. Today, I still enjoy a good “second wave” offering of my favorite brew. However, having taken a crash course in Coffee 101, I’ve come to appreciate the finer sensibilities that third wave highlights. My appreciation is not only for the quality of the craft beverage, but also for the political and economic impact coffee has globally. So, whatever “wave” you adhere too – here’s to COFFEE! Cheers!